The strawberries are finally ripe here! So Monday afternoon a friend and I made the two hour drive to Knapp’s Farm, where the strawberry plants were so loaded with fruit they drooped to the ground. In no time we had picked 30 pounds of plump, juicy berries. So what does one do with that many strawberries besides make jam? I have no idea, but I’m having fun finding out! It seemed like Dutch Babies and Strawberry Rum Syrup would be a great way to start. 2. Beat together the eggs, milk & salt. Then beat the flour into the mixture until smooth. 3. In a 9 to 10 inch skillet melt the butter over medium heat on the stovetop. Pour in the mixture and cook for exactly 1 minute. 4. Place the skillet in the oven and immediately turn the oven down to 350 degrees. 5. Bake until puffed over the edges and nicely browned; about 15 minutes. 6. 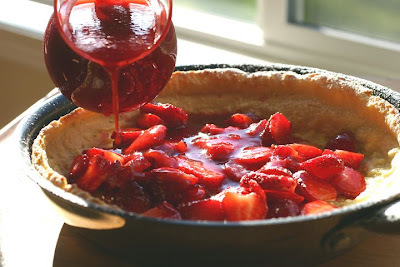 Remove from the oven and top with strawberries, powdered sugar, & strawberry syrup. Slide onto a plate, cut in half, and move half to another plate. Serve immediately. This stuff is so good I drizzled it over my cereal this morning. It would be great with ice-cream too. 1. Clean, hull, and puree strawberries in a food processor. Set aside. 2. In a medium sized sauce pan over medium high heat boil the water and sugar until clear. 3. Add the pureed strawberries, lemon zest, rum & salt. Bring to a boil and then lower the temperature until the mixture is at a high simmer. Cook for 15 minutes stirring occasionally. Syrup will thicken more as it cools. 4. Cool slightly and serve warm over pancakes. Cover leftover syrup and store in the refrigerator. Notes: Knapp’s Farm is located in the Green Bluff Growers Community just north of Spokane, Washington. The web site can be found at http://www.greenbluffgrowers.com/. Strawberry picking is one of my favourite summer activity! This dutch baby looks delicious! Gosh, this looks good. Strawberries are just starting to come in here. Discovered something to share. When you can't access a blog via blogger use your browser search engine. I've been able to access the 3 sites I was having problems with using a goggle search. Yummolicious! Wow, 30 pounds? Hope you put them up fast... you probably already know they get moldy quickly once their picked. Can I make a suggestion? 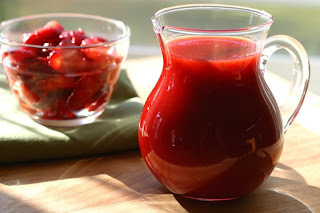 Use some to make Rose's strawberry conserve and/or puree - both very freezer friendly. I always have the puree in my freezer - good for so many uses! Oh, I almost forgot that I posted a recipe for fabulous strawberry muffins - they're so moist and delicious! Oh my, oh my... I should make them again soon. I just want to let you know I love your blog and if you get behind in your posting I will totally understand. Thanks for being understanding! Thank-you Risa. I appricate that a lot. Patricia I have that recipe stored away of your strawberry muffins! I will be making them at least once with all these. I cleaned and froze all 30 lbs the night I got home. They were so ripe and fragile even waiting until morning would have been bad. You always make such amazing dishes! Just look at those strawberries! Look at you and Rhum in the am:) Jewel like that sauce is..I'll have to try that..
Beautiful post..cannot wait to see what else you make..Do you have an Ice Cream maker? I think you do:)? I can just imagine..The window shots are so pretty. This looks fabulous! Yum and what a great way to eat berries! And you start your day with Strawberry Rum Syrup over your cereal? LOL! Great! dutch babies with just lemon and powdered sugar are my favorite breakfast treat. hands down. this looks fantastic!